The Secret Shot Shaping Solution Designed to Build More Confidence, Consistency & Variation in Your Game, So You Can Control the Ball Rather than it Controlling You! Imagine...being at a point in your golf game where you have a consistent golf swing and you’re now ready to add some shot shaping variations as well. IMAGINE…how good your game would be if you could add some new shots to your repertoire and finally master the ball instead of it mastering you! Golf University in conjunction with some of Australia’s and the world’s best teaching professionals have created a shot shaping solution that will build greater Consistency, Confidence and Variation in your game and it’s called the Shot Shaping Mastery Program and it’s the Secret to controlling the ball so it doesn’t control you! We've been told we're CRAZY to give away so much value for such a minor investment. But as you'll see, it's all worth it to help make YOU a better golfer! And at Golf University that's our mission and our passion. The Videos in the Shot Shaping Mastery Program are accessible on the internet – on your Personal Computer, iPad / Tablet or Smartphone, which means you can watch them at home, the office or even at the golf course, 24 hours a day – 7 days a week. 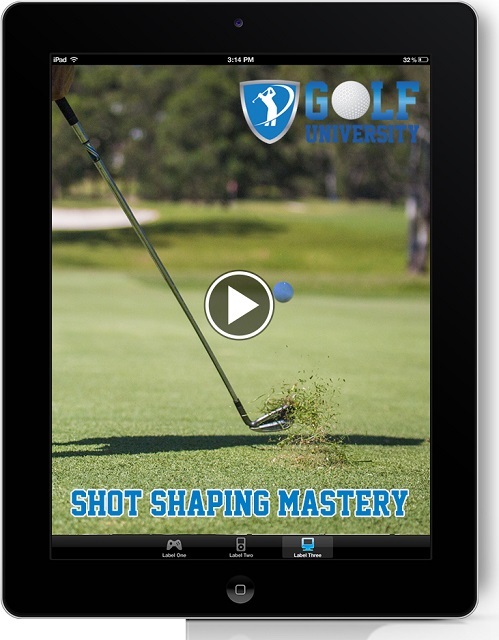 Think of Golf University's Shot Shaping Mastery Program as like having your own Personal Golf Pro! Simply click the link below for full access and in no time you’ll be feeling a lot more Confident, Consistent and in Control of your Shot Shaping.